Arsenal goalkeeper David Ospina may have found a way out of his abyss at the club, with ESPN reporting that Besiktas are interested in the stopper. 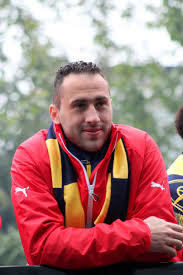 Ospina hardly featured for the Gunners last season as new signing Petr Cech made the number one spot his own. The only sticking point in his potential move to Turkey is that Besiktas are being put off by Arsenal’s high asking price. Ospina is an excellent choice to have as back-up, and could take some of the pressure off Cech if Arsenal find themselves in several competitions towards the end of the season. With that in mind, it’s unsurprising Arsenal are a little reluctant to sell unless they can command some serious money. The same source claims that Besiktas president Fikret Orman is determined to sign a “foreign goalkeeper”, but he added that “Arsenal want a lot for him”. What makes the situation even more unclear is that Arsene Wenger seems undecided on whether to keep third-choice Wojciech Szczesny. The Poland international has been on loan at Roma in Serie A, but while the Italian side are interested in extending his deal for another season, Arsenal are being hesitant over whether to let him leave. Surely, Wenger won’t keep both Szczesny and Ospina, as both are too good not to be playing regularly. At the same time, he can’t realistically allow both to leave, so Ospina’s deal may hinge on Arsenal’s negotiations with Roma. Now that Cech is in his mid-thirties, the club’s hierarchy do need start considering a contingency plan for when he retires, but it’s possible that neither Ospina or Szczesny will be part of that.